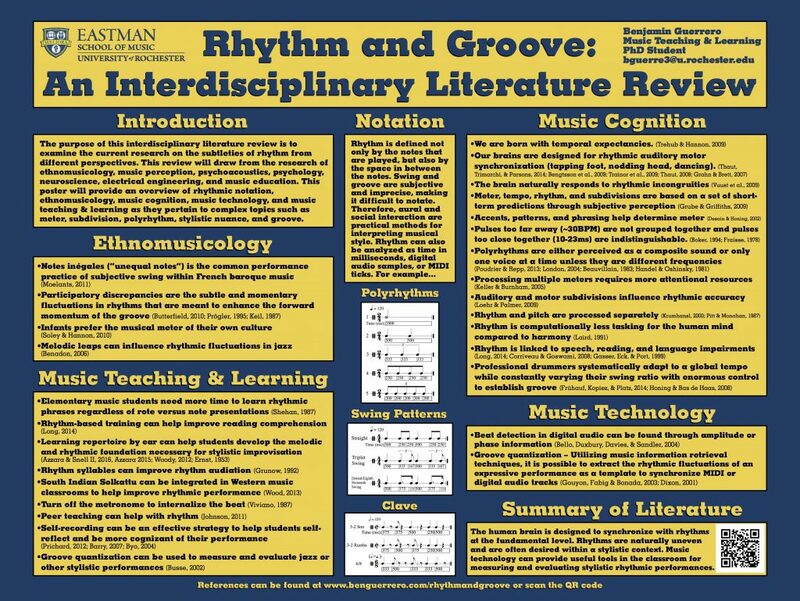 The purpose of this interdisciplinary literature review is to examine the current research on the subtleties of rhythm from different perspectives. This review will draw from the research of ethnomusicology, music perception, psychoacoustics, psychology, neuroscience, electrical engineering, and music education. This paper will provide an overview of rhythmic notation, ethnomusicology, music cognition, music technology, and music teaching & learning as they pertain to complex topics such as meter, subdivision, polyrhythm, stylistic nuance, and groove. Music notation is not meant to be an exact dictation of rhythm, but rather an approximation or interpretation of what one hears or wants another musician to perform. Since humans are not machines, it is impossible to play every note perfectly even, so human performances have some slight variation in temporal accuracy. Human-performed rhythms have natural fluctuations and do not always align with a metronome, particularly the inner beats. Even though rigorous practice is required to achieve near-perfect timing and rhythm, some music is expected to be played uneven and imperfect. Musical interpretation involves accents, dynamics, and purposeful tempo fluctuations that are often not written down. Musicians in a large ensemble are also required to adapt their time to that of the conductor’s baton. Temporal expectancies occur when one’s brain decomposes a pattern, however complex, and looks for the same or similar pattern in the near future (Desain, 1992). With these expectations, we can decipher rhythm, tempo, and meter. Our brains do this automatically to the extent where we try and create patterns where none may exist, such as looking at random numbers or abstract art (Potter, Fenwick, Abecasis, & Brochard, 2008). Rhythm is important because our brains are hardwired to respond and synchronize with rhythmic patterns (Thaut et al. 2009). Our brains’ motor control functions naturally respond to temporal structures, especially when the listener consciously monitors a rhythm. This explains why humans naturally tap their foot or finger, nod their head, or sway back and forth when listening to music. Our brains have trouble separating all the layers that we hear from complex rhythms and meters. We have the ability to focus on one sound or rhythmic sequence at a time and ignore all other sounds by treating them like “noise.” This process, called selective masking, is similar to when one can block out the sound of an air conditioner whirring in the background and focus on only the person speaking in the room. Another way we decipher complex sounds is by creating a composite pattern that combines all of the layers that are similar (Poudrier & Repp, 2013). Music is filled with natural rhythmic imperfections that are often desireable within a style. A jazz swing feel can change depending on tempo, style, and performer. A standard jazz swing pattern is notated as a dotted-eighth sixteenth, a triplet, or as eighth-notes, when in practice, it is constantly fluctuating and lies somewhere in between those rhythms. In 16th Century French Baroque music, this swing feel is known as notes inégales. Music Instrument Digital Interface (MIDI) data does not contain or produce any sound, but is rather a roadmap of when, where, and how notes from a synthesizer or sampler should be played. There have been many advancements made in varying the samples used including round robin sampling, articulations, ambience, instrument noises like key clicks and buzzing sounds, and performance analysis to account for pull-offs or alternate strings. Quantization is when notes, either MIDI or digital audio, are snapped to a metronomic grid with standard subdivisions. Groove quantization occurs when those notes are moved to a template that differs from the metronome. The templates can be made from a human performance or by manually moving each subdivision within a measure. This allows MIDI data to be played behind the beat or ahead of the beat on purpose to imitate the temporal qualities of a human performance. It is possible that the advancements made programming a computer how to adjust time between the beats can influence how music educators teach rhythmic accuracy. Subdivision is discussed regularly in classrooms, but not necessarily how to control it and apply that subtleness to musical performance, especially in different styles of music. The better we can understand our brain and how it processes and perceives rhythm, the better software we can program in the future that can then assist us in the future of music creation and education. Abramson, R. M. (1980). Dalcroze-based improvisation. Music Educators Journal, 66(2), 62-68. Anderson, W. T. (2011). The dalcroze approach to music education: Theory and applications. General Music Today, 26(1), 27-33. Apple, Inc. (2018). Logic pro x user guide (pp. 838-841). Cupertino, CA: Author. Azzara, C. D. (2015). Improvisation and composition: Developing musicianship in instrumental music. In S. L. Burton & A. H. Snell, II (Eds. ), Engaging musical practices: A sourcebook for instrumental music (pp. 181-198). Lanham, MD: Rowman & Littlefield Education. Barry, N. H. (2007). A qualitative study of applied music lessons and subsequent student practice sessions. Contributions to Music Education, 34, 51-65. Beauvillain, C. (1983). Auditory perception of dissonant polyrhythms. Perception & Psychophysics, 34(6), 585-592. Bello, J. P., Duxbury, C., Davies, M., & Sandler, M. (2004). On the use of phase and energy for musical onset detection in the complex domain. IEEE Signal Processing Letters, 11(6), 553-556. Benadon, F. (2006). Slicing the beat: Jazz eighth-notes as expressive microrhythm. Ethnomusicology, 50(1), 73-98. Bengtsson, S. L., Ullén, F., Ehrsson, H. H., Hashimo, T., Kito, T., Naito, E., . . . Sadato, N. (2009). Listening to rhythms activates motor and premotor cortices. Cortex, 2009(45), 62-71. Bergeson, T. R., & Trehub, S. E. (2006). Infants perception of rhythmic patterns. Music Perception: An Interdisciplinary Journal, 23(4), 345-360. Bie, O., & Baker, T. (1925). Rhythm. The Musical Quarterly, 11(3), 331-338. Boker, S. M. (1994). The perception of structure in simple auditory rhythmic patterns. (Master’s thesis), University of Virginia, Charlottesville, VA.
Bowyer, J. (2015). More than solfége and hand signs: Philosophy, tools and lesson planning in the authentic kodály classroom. Music Educators Journal, 102(2), 69-76. Busse, W. G. (2002). Toward objective measurement and evaluation of jazz piano performance via midi-based groove quantize templates. Music Perception: An Interdisciplinary Journal, 19(3), 443-461. Butterfield, M. (2010). Participatory discrepancies and the perception of beats in jazz. Music Perception: An Interdisciplinary Journal, 27(3), 157-176. Byo, J. L. (2004). Teaching problem solving in practice. Music Educators Journal, 91(2), 35-39. Caldwell, T. (1993). A dalcroze perspective on skills for learning. Music Educators Journal, 79(7), 27-29. Chadabe, J. (1997). Electric sound: The past and promise of electronic music. Upper Saddle River, NJ: Prentice Hall. Collins, M. B. (1964). The performance of sesquialtera and hemiolia in the 16th century. Journal of the American Musicological Society, 17(1), 5-28. Corriveau, K. H., & Goswami, U. (2009). Rhythmic motor entrainment in children with speech and language impairments: Tapping to the beat. Cortex, 45, 119-130. Dawe, L. A., Platt, J. R., & Racine, R. J. (1995). Rhythm perception and differences in accent weights for musicians and nonmusicians. Perception & Psychophysics, 57(6), 905-914. Desain, P. (1992). A (de)composable theory of rhythm perception. Music Perception: An Interdisciplinary Journal, 9(4), 439-454. Desain, P., & Honing, H. (2003). The formation of rhythmic categories and metric priming. Perception, 32, 341-365. Dixon, S. (2001). Automatic extraction of tempo and beat from expressive performances. Journal of New Music Research, 30(1), 39-58. Ernst, K. D. (1953). The place of reading in the elementary music program. Music Educators Journal, 39(3), 26-28. Fraisse, P. (1978). Time and rhythm perception. In E. C. Carterette & M. P. Friedman (Eds. ), Handbook of perception, vol. 8 : Perceptual coding. New York, NY: Academic Press. Frühauf, J., Kopiez, R., & Platz, F. (2013). 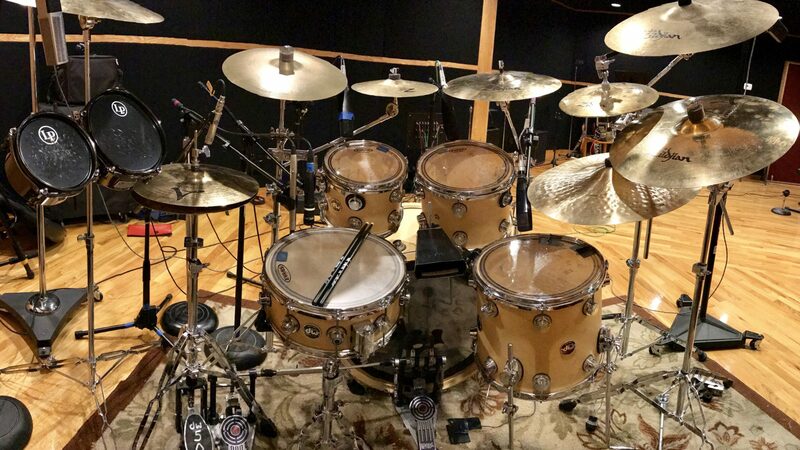 Music on the timing grid: The influence of microtiming on the perceived groove quality of a simple drum pattern performance. 17, 2(246-260). Gasser, M., Eck, D., & Port, R. (1999). Meter as mechanism: A neural network model that learns metrical patterns. Connection Science, 11(2), 187-216. Geiser, E., Ziegler, E., Jancke, L., & Meyer, M. (2009). Early electrophysiological correlates of meter and rhythm processing in music perception. Cortex, 45, 93-102. Gelfand, S. A. (2004). Hearing: An introduction to psychological and physiological acoustics (4th ed.). New York, NY: Marcel Dekker. Gouyon, F., Fabig, L., & Bonada, J. (2003). Rhythmic expressiveness transformations of audio recordings: Swing modifications. Paper presented at the 6th Int. Conference on Digital Audio Effects (DAFX-03), London, UK. Grahn, J. A., & Brett, M. (2007). Rhythm and beat perception in motor areas of the brain. Journal of Cognitive Neuroscience, 19(5), 893-906. Grube, M., & Griffiths, T. D. (2009). Metricality-enhanced temporal encoding and the subjective perception of rhythmic sequences. Cortex, 45, 72-79. Grunow, R. F. (1992). The evolution of rhythm syllabes in gordon’s music learning theory. Quarterly Journal of Music Teaching and Learning, 3(4), 56-66. Handel, S., & Oshinsky, J. S. (1981). The meter of syncopated auditory polyrhythms. Perception & Psychophysics, 30(1), 1-9. Hannon, E. E., Snyder, J. S., Eerola, T., & Krumhansl, C. L. (2004). The role of melodic and temporal cues in perceiving musical meter. Journal of Experimental Psychology: Human Perception and Performance, 30(5), 956-974. Honing, H., & Bas de Haas, W. (2008). Swing once more: Relating timing and tempo in expert jazz drumming. Music Perception: An Interdisciplinary Journal, 25(5), 471-476. Johnson, E. A. (2011). The effect of peer-based instruction on rhythm reading achievement. Contributions to Music Education, 38(2), 43-60. Johnson-Laird, P. (1991). Rhythm and meter: A theory at the computational level. Psychomusicology, 10(2), 88-106. Keil, C. (1987). Participatory discrepancies and the power of music. Cultural Anthropology, 2(3), 275-283. Keil, C. (1995). The theory of participatory discrepancies: A progress report. Ethnomusicology, 39(1), 1-19. Keller, P. E., & Burnham, D. K. (2005). Musical meter in attention to multipart rhythm. Music Perception, 22(4), 629-661. Krumhansl, C. L. (2000). Rhythm and pitch in music cognition. Psychological Bulletin, 126(1), 159-179. Loehr, J. D., & Palmer, C. (2009). Subdividing the beat: Auditory and motor contributions to synchronization. Music Perception: An Interdisciplinary Journal, 26(5), 415-425. London, J. (2012). Hearing in time: Psychological aspects of musical meter (2nd ed.). Oxford, UK: Oxford University Press. Longuet-Higgins, H. C., & Lee, C. S. (1984). The rhythmic interpretation of monophonic music. Music Perception: An Interdisciplinary Journal, 1(4), 424-441. Loy, G. (1985). Musicians make a standard: The midi phenomenon. Computer Music Journal, 9(4), 8-26. Mead, V. (1994). More than mere movement: Dalcroze eurhythmics. Music Educators Journal, 82(4), 38-41. Miller, B. O. (1993). Time perception in music meter perception. Psychomusicology, 12(2), 124-153. Moelants, D. (2011). The performance of notes inégales: The influence of tempo, musical structure, and individual performance style on expressive timing. Music Perception: An Interdisciplinary Journal, 28(5), 449-460. Moelants, D., & Van Noorden, L. (2005). The influence of pitch interval on the perception of polyrhythms. Music Perception, 22(3), 425-440. Pieslak, J. (2007). Re-casting metal: Rhythm and meter in the music of meshuggah. Music Theory Spectrum, 29(2), 219-245. Pitt, M. A., & Monahan, C. B. (1987). The perceived similarity of auditory polyrhythms. Perception & Psychophysics, 41(6), 534-546. Pohlmann, K. C. (2010). Principles of digital audio (6th ed.). New York, NY: McGraw-Hill Education TAB. Potter, D. D., Fenwick, M., Abecasis, D., & Brochard, R. (2009). Perceiving rhythm where non exists: Event-related potential (erp) correlates of subjective accenting. Cortex, 45, 103-109. Poudrier, È., & Repp, B. H. (2013). Can musicians track two different beats simultaneously? Music Perception, 30(4), 369-390. Prichard, S. (2012). Practice makes perfect? Effective practice instruction in large ensembles. Music Educators Journal, 99(2), 57-62. Prögler, J. A. (1995). Searching for swing: Participatory discrepancies in the jazz rhythm section. Ethnomusicology, 39(1), 21-54. Rankin, S. K., Large, E. W., & Fink, P. W. (2009). Fractal tempo fluctuation and pulse prediction. Music Perception: An Interdisciplinary Journal, 26(5), 401-413. Repp, B. H. (2008). Metrical subdivision results in subjective slowing of the beat. Music Perception: An Interdisciplinary Journal, 26(1), 19-39. Shamrock, M. (1986). Orff schulwerk: An integrated foundation. Music Educators Journal, 72(6), 51-55. Shehan, P. K. (1987). Effects of rote versus note presentations on rhythm learning and retention. Journal of Research in Music Education, 35(2), 117-126. Soley, G., & Hannon, E. E. (2010). Infants prefer the musical meter of their own culture: A cross-cultural comparison. Developmental Psychology, 46(1), 286-292. Suzuki, S. (1983). Nutured by love: The classic approach to talent education. Smithtown, NY: Exposition Press. Thauht, M. H., Stephan, K. M., Wunderlich, G., Schicks, W., Tellman, L., Herzog, H., . . . Hömberg, V. (2009). Distinct cortico-cerebellar activations in rhythmic auditory motor synchronization. Cortex, 45(2009), 44-53. Thauht, M. H., Trimarchi, P. D., & Parsons, L. M. (2014). Human brain basis of musical rhythm perception: Common and distinct neural substrates for meter, tempo, and pattern. Brain Sciences, 4, 428-452. Trainor, L. J., Gao, X., Lei, J.-j., Lehtovaara, K., & Harris, L. R. (2009). The primal role of the vestibular system in determining musical rhythm. Cortex, 45, 35-43. Trehub, S. E., & Hannon, E. E. (2009). Conventional rhythms enhance infants’ and adults’ perception of musical pattern. Cortex, 45, 110-118. Viviano, S. (1987). The metronome: Its use and misuse. American Music Teacher, 37(1), 28. Vurkaç, M. (2011). Clave-direction analysis: A new arena for education and creative applications of music technology. Journal of Music, Technology & Education, 4(1), 27-46. Vusst, P., Ostergaard, L., Pallesen, K. J., Bailey, C., & Roepstorff, A. (2009). Predictive coding of music – brain responses to rhythmic incongruity. Cortex, 45, 80-92. Wilson, M. (2012). Practice mythbusters: Common misconceptions about practice for advanced students. American Music Teacher, 61(6), 30-32. Wood, B. K. (2013). South indian “solkattu” and western music pedagogy: Creating new rhythmic perspectives. Music Educators Journal, 99(4), 63-67. Woodrow, H. (1933). Individual differences in the reproduction of temporal intervals. American Journal of Psychology, 45(2), 271-281. Woodrow, H. (1934). The temporal indifference interval determined by the method of mean error. Journal of Experimental Psychology, 17(2), 167-188. Woody, R. H. (2012). Playing by ear: Foundation or frill? Music Educators Journal, 99(2), 82-88. Zagorski-Thomas, S. (2007). The study of groove. Ethnomusicology Forum, 16(2), 327-335.